Writers are taught that there are only seven basic plots, and every story is just a variation on one of those. Recipes work the same way. You’ve got savory, sweet, salty, sour, bitter, crunchy, creamy, chewy … umm … oh, colorful … and … that’s about all I’ve got. And with food you have to combine several of the basic components to make a good dish. No one wants to eat a bowl of salt, after all. So if you’ve ever got too much of something and you’re looking for a way to use it, just ask yourself, “What else is similar to this, and what do I make with that?” Match savory for savory, salty for salty, and you can swap out ingredients all kinds of ways. This week I was making pulled pork, and as much as we like it my family can’t go through seven pounds of it without getting burned out. I’ve done pulled pork nachos before, and that’s where inspiration struck: Instead of just replacing the chili with pulled pork, I’ll make the chili with the pork! For this, I’m assuming you’ve made chili before. If not, click those two links above for a couple of chili recipes. The assembly goes a little differently, though. Instead of simmering for several hours, the pork will roast for several hours and the chili comes together quickly at the end. Check out this previous post for how to do pulled pork in a Dutch oven, but ignore the seasoning. Just get it in a covered pot and let it cook until it’s fork tender. When the pork has been cooking for about four hours, get started on the chili. Put the crushed tomatoes in a large pot over low heat, and stir in the chili powder, garlic, and whatever other spices you normally use. While the tomatoes are warming up, chop the onions and peppers and put them in a frying pan over high heat with a little bacon fat. Toss them around and cook until lightly browned and a little soft, then add them to the tomatoes. Drain and rinse the beans and add them to the pot. Oh, right, the beans. Frequently I’ll make my chili with no beans, especially if it’s going to end up on either hot dogs or nachos. 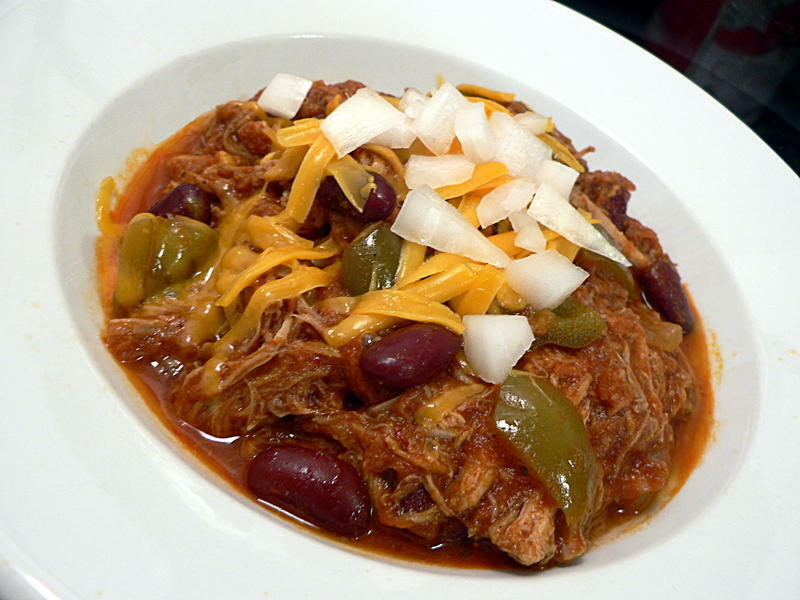 With the pulled pork, the beans aren’t absolutely necessary but I find the added texture really helps. Check the pork and see if it’s ready to pull. Shred it – see the previous post for the two-forks method. By the time you’re done pulling the pork the sauce should be starting to bubble. Add a couple of pounds of the pork to the pot of sauce and mix well to make sure it’s all combined. Serve with diced onions and shredded cheese.